Tacy Atkinson (1870-1937) was an American from Salem, Nebraska. She lived with her family in the Ottoman Empire for fifteen years (1902-17) and witnessed the destruction of Armenians in 1915. Her diaries now constitute an invaluable resource for historians of this period. "We have had women, children and boys come to us bruised, hacked and bleeding. One little girl from Huiloo. She says that women were stripped, then laid two together and their heads cut off. She happened to be the under one and she escaped with a deep cut in the back of her neck and came here. These people I met were put into a church yard for over night. They can't go far. They will be killed close by." August 9, 1915. 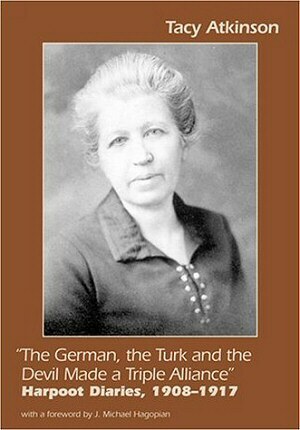 "The German, the Turk and the Devil Made a Triple Alliance": Harpoot Diaries, 1908-1917 - Amazon's online bookstore.